The Premium Midsized SUV segment in Europe continues its surge, with sales up 29% in the first half of 2015, boosted by new introductions to the segment, but also continued strength of the existing models, as only 2 SUVs show year-over-year declines (not including the discontinued Land Rover Freelander). The Volvo XC60 confirms it is now the new leader of the segment, with sales up 31% on last year. The XC60 has really been boosted by its facelift and engine updates last year, as it enjoyed record sales in 2014, and is set to do even better this year. 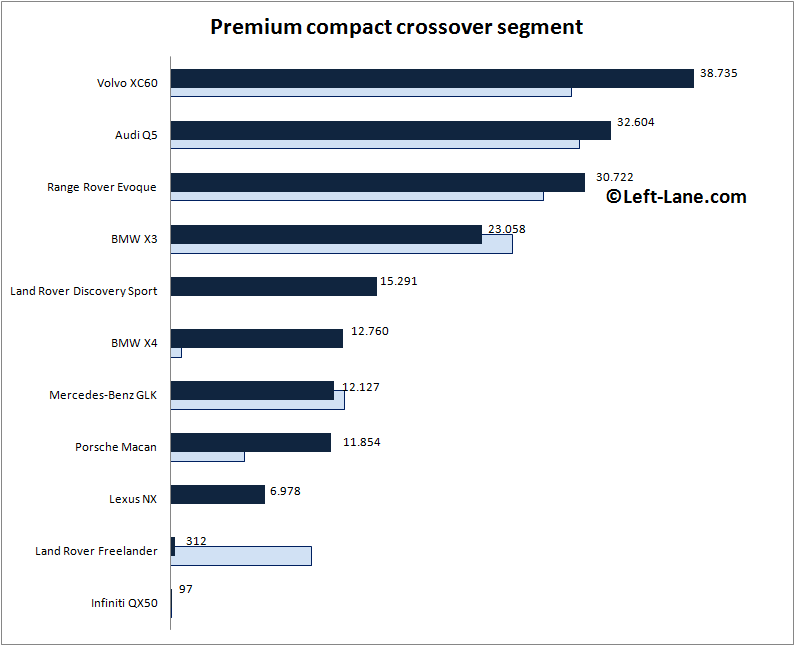 As I predicted in the Q1 segment analysis, the Audi Q5 reclaims second place from the Range Rover Evoque. The Evoque will be updated later this year, and a convertible version will be added, although I doubt that will add a lot of volume to the model. A new generation Q5 should arrive next year, but Audi hasn’t yet confirmed this. Land Rover is the best selling brand of premium compact SUVs, with the Evoque and its new sibling Discovery Sport adding up to more than 46.000 units in the first half. BMW is third behind Volvo with combined sales of almost 36.000 units of the X3 and X4. The Mercedes-Benz GLK is down 6% in the first half as the new generation, which is called GLC, has already been revealed. The GLK was in fifth place in Q1, but was outsold by the BMW X4 with a 2 : 1 ratio in June, helping the X4 pass the GLK year-to-date, as the Discovery Sport has also done. The Porsche Macan looks set to do the same in the next quarter, as it’s never far behind the X4 in sales pace. Sales of premium compact SUVs are down 4% in the first half of 2015, despite the introduction of the Mercedes-Benz GLA last year. The GLA almost doubles its volume, and the recently facelifted class leader Audi Q3 is also up: 16% in Q2 and 5% in the first half. The other two models in the segment are down with double digits, as they’re starting to show their age. The BMW X1 will be replaced later this year, and the new generation will be a front-wheel drive crossover like the Mini Countryman, although four-wheel drive will be available. The Countryman was slightly updated last year, but not enough to keep the model from losing 28% of its volume. The new generation is already being tested, although it won’t reach showrooms until the second half of 2016. A replacement for the Mini Paceman is not planned. I understand you’re missing the Jeep Cherokee in this ranking. We’ve decided to classify the Cherokee in the mainstream midsized SUV segment.